Choice, personalization and flexibility are hallmarks of the new Yahoo! Canada homepage announced today, the company says. The launch is a continuation of the global rollout of the new Yahoo home page in markets across the world, Max Tremblay, director of marketing for Yahoo Canada told ITBusiness.ca. Follow Joaquim P. Menezes on Twitter. 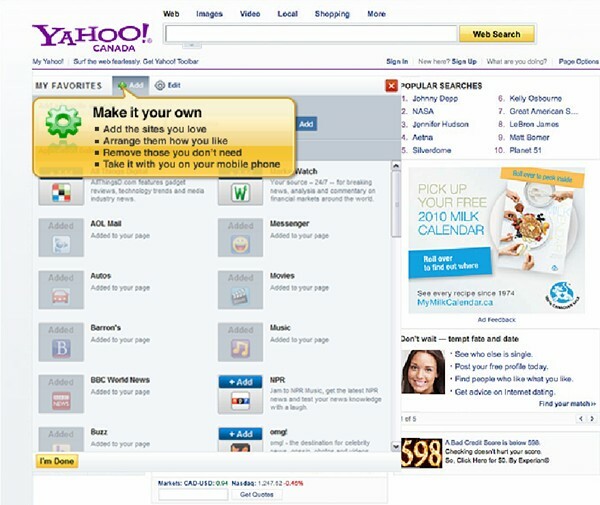 He said Yahoo decided to make the new homepage available to eight key global markets, including Canada. 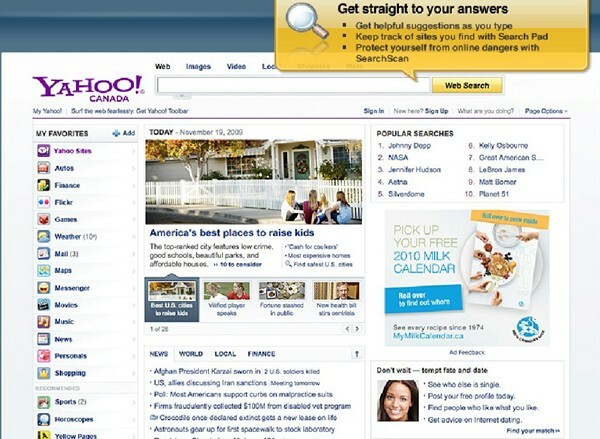 The U.S. launch, in October 2009, widened the reach of the Yahoo brand – and intensified user engagement, Tremblay said. The Canadian launch, Tremblay said, would likely have a similar positive impact on engagement and traffic among users here. But he pointed to at least one key difference between the U.S. and Canadian versions of the new home page. The way Canadian users will access information through the My Favourites section will be different from how their U.S. counterparts do it. He said this change, which was based on feedback provided by users of the U.S. site, would offer Canadians greater control, and make for a better experience. With the new home page launch, Yahoo Canada is positioning its site as a central hub – a one-stop location from where users can directly access their favourite applications and sites. To that end, the new home page makes it simple for users to add their favourite applications/sites. You click the Add button and in the two fields displayed, type or paste the URL and name of the site you want to add. Once a site is added, its icon appears in your Favourites Section. 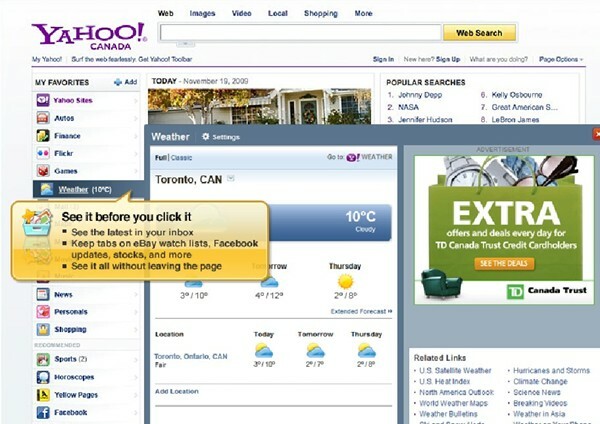 By adding your Facebook page you can access your Facebook stream right on your personalized Yahoo Canada page. You can even post to Facebook from within the home page. To provide this capability, it seems Yahoo Canada has relied on Facebook Connect , a set of APIs that developers/Web site administrators can implement to allow Facebook members to log on to their sites with their Facebook identity. Tremblay emphasized that the primary purpose of the new home page is to allow people – from a single place – to do all of their online activities: banking, social networking, looking for jobs online, checking out the news et al. Within these categories, he said, there are personalization features available to users. “It strikes me as being pretty user friendly,” said Michelle Warren, president of Michelle Warren Research and Consulting, a technology consulting firm in Toronto. She said the page serves as a hub from where users can access their various social networks, manage multiple communication channels – e-mail, instant messenger – and receive news updates. But to make optimal use of all the personalization features, a user would need to “invest a fair amount of time” – a minimum of 15–20 minutes – setting it all up. I do expect these new features to improve the stickiness of the home page, causing more users to visit it and stay longer, which from a marketing standpoint would be great for Yahoo Canada, Warren said. 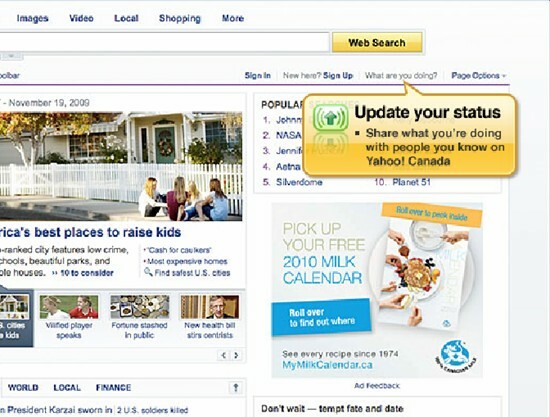 Yahoo Canada’s Tremblay acknowledges that the needs of potential advertisers were also front-and-centre during the design of the new home page. So the My Favourites section includes a new ad position that’s designed to support contextual or personalized advertiser messaging. For instance, he said, a message around temperature control for the car could be presented with the Weather section in My Favourites – because it would be relevant there. He said these are some ways advertisers can customize messaging on their product’s features in locations where people might be more receptive to those kinds of ads. Hyundai Canada and Scotiabank are inaugural advertisers on the new Yahoo! Canada homepage. Hyundai is using the new home page to publicize the re-launch of the 2010 Hyundai Tucson, while Scotiabank will be promoting its RSP campaign on the site. Yahoo Canada’s coverage of the upcoming Winter Olympics will be featured prominently on the new homepage. Expert commentary from well-known Canadian athletes including Elvis Stojko (figure skating), Ken Daneyko (hockey), and Jennifer Jones (curling), who will bring a uniquely Canadian perspective to their Olympics coverage. Sports coverage from former Globe and Mail reporters Steve McAllister and Ian Denomme. Yahoo’s Olympic mobile site, scheduled to launch February 9, will offer updates on the latest happenings, including medal counts, news and expert coverage, live results, athlete profiles and more. The Canadian launch will be both in English and French. Tremblay cited this as one of the unique features of the launch here. Making this happen properly, he said, involved a lot of work. We had to customize the experience not only at the features, but also at the linguistic and cultural level.